Check heat, cooling, water, landscaping, etc. 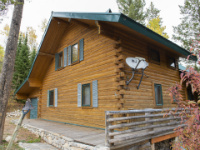 This is a beautiful log cabin in the woods that will accommodate a large family or group and provide everything you need to relax right at the house. If you’re looking to explore the valley, or venture over to Jackson – this is a great location being at the far west / south side of the valley, affording easy access to Grand Teton National park, skiing Targhee or the Jackson resorts, Yellowstone, and more! In the warmer months, you can enjoy the large wraparound decks and quiet wooded seclusion around this property. Inside the house, you’ll find a nice book and DVD library on the main floor, as well as Apple TV for your streaming TV options (sorry, no other television service available). In the daylight basement is the great game room, sporting a wet bar & pool table – this is a fantastic place for entertaining!